Please lower your head for a moment of silence. Over the years, Paramount established an identity as the studio least likely to “double-dip”. For better or for worse, the DVD you found was the DVD you got, and you could essentially rest assured that a new and improved version wouldn’t hit the shelves in the near future – or maybe ever. That situation started to change with the re-release of the Star Trek movies, and it’s expanded from there. Now Paramount puts out many reissues of older titles. Some of these stand as notable improvements; for instance, I thought the “Special Collector’s Edition of Titanic was the best DVD of 2005, as it offered picture, sound and extras superior to the original version. Others are only minor improvements at best. While these double-dips proliferated, at least Paramount avoided the triple-dip. Other studios indulged in those. Heck, some such as Sony have even offered quadruple-dips! But not Paramount, as they never reached the point of a third release of one title. Not until now, that is. With this “50th Anniversary Collection” DVD of 1956’s The Ten Commandments, the studio has officially triple-dipped for the first time. They initially released a bare-bones version back in 1999. They followed this with a Special Collector’s Edition in 2004. Both releases offered virtually identical picture and sound, but the SCE included a nice roster of new extras. I’ll deal with how this DVD compares with its predecessors later. This area is supposed to cover my thoughts on the movie itself, but after two prior reviews, I think I’ve beaten that dead horse enough. If you’re curious to see my full opinion of Commandments, hop on one of the links above to get the skinny. Suffice it to say the movie leaves me unimpressed. It offers a few impressive sequences but mostly seems like dated, theatrical camp to me. It doesn’t explore its story and it now appears hammy and cheesy. 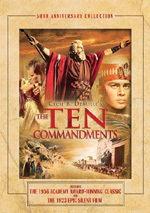 The 2004 Ten Commandments DVD appeared to offer the same picture and audio as the 1999 release. Although the 2006 version’s press release indicates it was “pristinely restored and remastered”, I saw and heard no differences from the earlier discs. The new one showed all the same positives and negatives. While the 2004 “Special Collector’s Edition” included a nice set of extras, this “50th Anniversary Collection” improves on those. It replicates everything from its predecessor and adds a few new components as well. I’ll mark everything unique to this set with an asterisk. If you don’t see a star, that means the element also appears on the SCE. Spreading across Discs One and Two, we find an audio commentary from Katherine Orrison, the author of Written in Stone: Making Cecil B. DeMille’s Epic, The Ten Commandments. Orrison gives us a running, screen-specific track. She doesn’t start to talk until a few minutes into the disc, as she only begins after the overture and DeMille’s introduction. However, once she launches into her chat, she rarely pauses. Over on DVD Three, we get the big attraction from the “50th Anniversary Collection”: the full *1923 Version of The Ten Commandments. Also directed by Cecil B. DeMille, this silent rendition lasts 136 minutes and presents a very different take on the film. This one starts with Egypt in the midst of the plagues and progresses through the exodus and the arrival of the Commandments. Those elements fill the movie’s first 50 minutes and then it takes a very strange twist. We come to modern day and meet the McTavish family. The mother (Edythe Chapman) is a real Bible-thumper, and her nice son John (Richard Dix) follows her. However, son Dan (Rod La Rocque) doesn’t believe in God. Into their home comes a homeless girl named Mary (Leatrice Joy). Both brothers fall for her, but she marries the sinful, ambitious Dan. 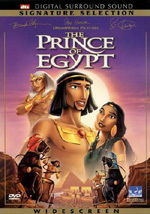 The movie follows their triumphs and travails as we learn that God and the Commandments trump everything else. The Biblical parts of the movie are interesting to see, but the McTavish sections are a real drag. They make this a tedious piece of moralizing with nothing special to it. Those bits could appear in many other stories, and they dilute the potential impact of the Biblical parts, especially since those offer much greater room for power and drama. I think it’s cool that the 1923 version appears here, as it obviously boasts historical value. Unfortunately, it’s a bad movie. At least the DVD presents it well. The film looks much better than expected. It suffers from a fair amount of softness, but source flaws are shockingly absent. The movie offers a very clean piece. The added stereo score sounds quite good too. This is a fine transfer. If desired, we can watch the 1923 Commandments with another *audio commentary from Orrison. She provides a running, screen-specific chat. She tells us biographical information about the cast and crew as well as production notes, comparisons with the 1956 version, and information about the era in which this one was made. Orrison tries particularly hard to put us in that period’s mindset since she believes you need to view a 1923 movie with 1923 eyes. Unfortunately, I think Orrison simply tells us what she likes about the flick too much of the time, especially during its third act. For the last portion, she does little more than gush about props and narrate the tale. Still, much of the time she remains chatty and engaging. This commentary doesn’t compare with the one she recorded for the 1956 version, but it does have many good moments. 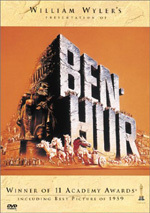 DVD Three also includes *Hand-Tinted Footage of Exodus and Parting the Red Sea. This 14-minute and 57-second segment shows those segments with very minor coloring. They look brown more than anything else, and the tint adds nothing to the presentation. Indeed, since the quality of the source is very bad, it looks much worse than the main feature. After 50 years, The Ten Commandments remains the best-known cinematic representation of Moses. However, I don’t think it’s the highest quality rendition, and the film hasn’t held up terribly well over the years. From hammy acting to cheesy sets to silly dialogue, Commandments suffers from the overblown pomposity that commonly affected epics. However, I must acknowledge that the movie receives a good treatment on DVD. The disc offers very solid picture and sound, and it also presents a roster of extras highlighted by two good audio commentaries and the film’s original 1923 version. For folks who don’t already own a Commandments DVD but want one, I’d definitely recommend this 50th Anniversary Collection. However, I’m not so sure those who already own one of the prior releases need to upgrade. I noticed no improvements in picture and sound. The inclusion of the 1923 Commandments is a strong attraction, though. I didn’t care for it, but I’m sure many fans would love to see it. If you fall into that category, then this would be a smart purchase.